Japan’s oldest religion is Shinto. Shinto has no founder, no holy book and not even the concept of religious conversion. The core concept is that deities, kami, preside over all things in nature, be they living, dead or inanimate. Shinto values include harmony with nature and virtues such as magokoro (sincere heart). Many Japanese practice Shinto; however, few are purely Shinto. Many Japanese also practice Buddhism. Shinto has shrines and are most easily distinguished by their typically vermilion (red) tori gateways, constructed by two posts with two rails at the top. After 3 days of walking around Tokyo looking at temples and shrines, many of them have just blended together into two categories, those with tori gates and those without. The tour of shrines and temples started at Sensoji Temple in Asakusa. Just a few steps from the subway exit, I found the Kaminarimon Gate (“Thunder Gate”). The gate was built in 946 and burned down several times, the last in 1865 and not rebuilt until 1960. Kaminarimon Gate stands big and impressive at the head of a long row of shops leading to the temple complex. Arriving early in the morning, before the area was laden with rickshaw tour operators and tour groups, made the visit reasonably pleasant and peaceful. Sensoji temple was built in the 645 and escaped damage in the 1923 Tokyo Earthquake only to be destroyed during WWII. All the buildings have been rebuilt following their Edo-era layout. In addition to the main temple building, the complex offers a 5-story pagoda, several smaller buildings, a pond with koi and several stone lanterns and statues. After a reasonably quick meditative stroll around the complex, I was on my way to my next destination on my aggressive list of sites to see during my time in Tokyo. A popular part of the visit to Sensoji (or most temples, although Sensoji is one of the few that has them in English on the reverse side) is to get a paper fortune called an omikuji. After paying your 100 yen, you grab one of the metal canisters of sticks and make your wish. Once your wish is made, modestly shake the canister twice (or several times) until a stick comes out. Each stick has a number written on it in kanji (Japanese writing). So after a bit of matching the symbols on the stick to the symbols on the drawers containing the fortunes, you get your fortune. If it is a good fortune, then be happy with it. If it is a bad fortune, then don’t be upset. Simply tie it to the nearby rack so the wind can carry it away, ask the gods for better luck and try again later. So I dutifully paid my 100 yen, shook the canister and matched my number (66) to the drawer. No. 66 is Bad Fortune. So I tied it to the rack and walked away. When I came back to the temple are the next day for some souvenir shopping, I figured I would try it again, maybe being a little more specific with my wish. This time I got No. 97. Bad fortune again…sigh. Hopefully that changes soon. Zojoji Temple in the Shimbashi area was my next planned destination. I say planned, because it took a little extra effort and a lot of walking to get there. I’ve navigated big cities (namely Paris when I was 17) using pretty much only a subway map and the information maps that are located on many corners at big intersections and near the subway entrances. So I got off at the Shimbashi station and set out walking in what I thought was the correct direction. When I reached the Higashi-ginza station, I discovered that I had walked about 20 minutes in the wrong direction. So I turned around, and after finding a set of elevated subway tracks, I decided to follow those as closely as I could to get to the station that was my original destination. At the next map I found, I discovered that I was actually reasonably close to the Hama-rikyu Gardens, another spot that was on my list of places I was trying to see that day. Turning left, I headed for the garden, finding it in short order. Hama-rikyu Gardens were the family garden of the Tokugawa Shogun, built in 1654. All of the buildings and the vegetation were destroyed between the 1923 earthquake and the bombings in WWII and then rebuilt. The gardens are a nice oasis of green in the city, quiet and pleasant, the sounds of the city muffled by thick trees. Inside the 62-acre gardens the main places of interest are the tidal pond with the 3 tea houses, two duck hunting ponds, and a 300 year old black pine. The Hama-rikyu has a free Ubiquitous Audio Tour. At the entrance they give you a smart device (basically like a smart phone) that you wear on a lanyard around your neck and an earphone. As you walk by the 27 places of interest along the tour, the smart device uses GPS technology to identify which place you are by and then plays an audio clip describing the place of interest and the history surrounding it. A lot of the extra information was very helpful and contained some very interesting facts. With my feet starting to form a couple of hot spots, I continued on in my quest to find Zojoji Temple. To aid in navigation, I did actually ask the worker at the garden entrance when I returned my ubiquitous audio tour device. After another 20 minute walk and a stop for a late lunch at a curry shop, I finally found the temple complex. The Zojoji temple complex is much smaller than the Sensoji temple. The Zojoji temple was established in 1393 and was moved to its current location in 1598 to protect the city spiritually from a southeasterly direction. The wooden temple gate is the only structure that remains of the original 17th century temple buildings. The main building was rebuilt in 1974, after being destroyed between the earthquake in 1923 and the bombings of WWII. 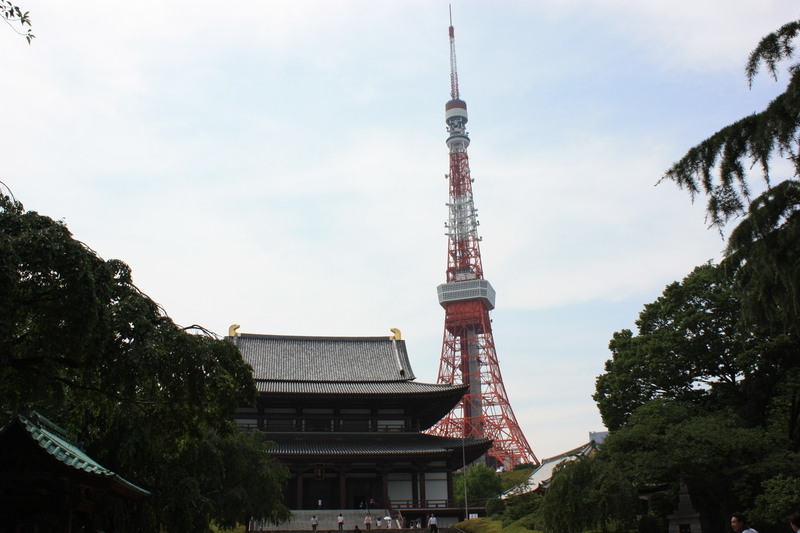 Now the temple lies in the shadow of the Tokyo Tower, the red and white tower that is modeled after the Eiffel Tower, just taller. Seeing the tower brought back memories of my trip with my dad to Japan in 1982 when I did actually go up to the observation deck to see the view of the city. After a short walk to the subway station, my feet got a little bit of a rest on the 20 minute ride to my next destination, the Kashiwa Karokuen Gardens. Finding the gardens proved to be challenging. Following the information provided on my Tokyo Subway App instead of actually checking the exit information on the signs in the station, I went out exit 8 instead of exit 2, which would have been a much better choice. After wandering around for quite awhile, I did actually find the Tokyo Dome home of the Yomiuri Giants (Tokyo Giants) and signs pointing me in the direction of the gardens… just a mere 350 meters (nearly a ¼ mile) along a white wall by baseball fields where adorable kids were having baseball practice. When I planned out my time I had hoped to have some time to just sit in the garden and maybe write a little. With all of my navigational detours, by the time I finally reached the gardens I had about an hour to explore and enjoy. 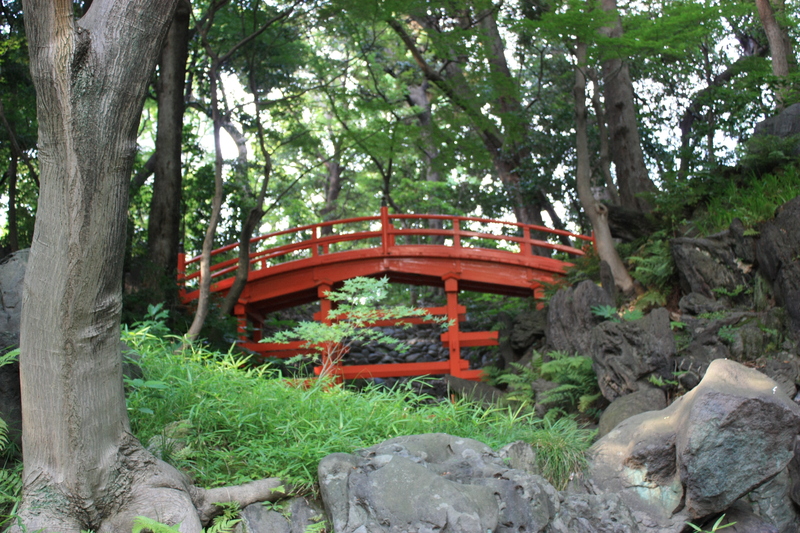 The picture in my guidebook that had drawn me to seeking out this garden was the Tsuten-kyo bridge, a vermilion (red) bridge that is a copy of a famous bridge in Kyoto that I had seen on my trip in 1982. Finding the bridge proved tricky since the location marked on the map had a different spelling than the picture and label of points of interest in the brochure that I was given at the entrance. On my search for it, I did see the Full Moon Bridge (Engetsu-kyo), so named because the reflection of the bridge in the water forms the image of a full moon. Even though renovation work was underway near the bridge, they did have enough water in the pool by the bridge to give it the full effect. I also saw the iris field and the rice paddies, and the Chinese style path and the central island, all of which were pretty but not my goal. With 20 minutes remaining until the park closed, I returned to the entrance and asked them, using a lot of pointing and short words, where the red bridge was. Armed with a location on the map, I made a bee-line for the bridge. Seeing the bright red surrounded with lush green was definitely worth all of the effort. I spent as much of the remaining time that I had in the park taking pictures and just sitting on a rock near the bridge as I could. My feet appreciated the short respite. Amongst all of the temples and shrines that I visited over the course of my days in Tokyo, the Meiji Jingu (Shrine) was my favorite. Meiji Jingu is an oasis of lush green, the comforting aroma of the cedars and cypress trees permeating the air. 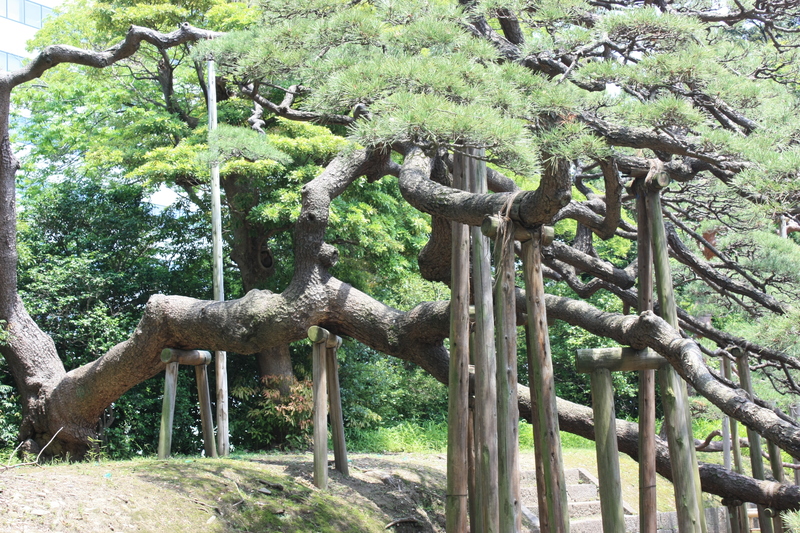 The natural forest surrounding the shrine was hand planted when the shrine was first built. Now, generations later, it is considered a self-sustaining natural forest. A broad grey gravel path provides a meditative walk, leading you away from the main street through the forested area up to the tranquil area of the temple complex. Three unpainted cypress tori gates grace the path to the main shrine, the second or grand shrine gate, is the largest tori of that style in Japan. Each pillar is 1.2 meters (about 4 feet) in diameter and the crosspiece is 17 meters (55.7 feet) long. Very impressive and very beautiful! Approaching the shrine, I followed the directions in the pamphlet on how to pay respect at Meiji Jingu. 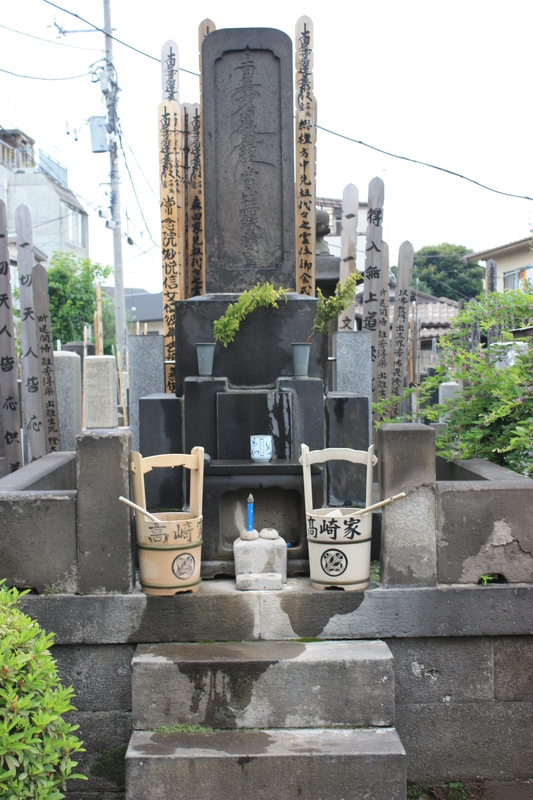 At the Temizuya, a cistern with running water and dippers (cups on long handles), I did the purification ritual. Using a dipper, I rinsed my left hand, then my right hand, then poured water into my left hand and rinsed my mouth, then rinsed my left hand and replaced the dipper. Then at the main shrine building, I made my wish, threw some coins in the offeratory box, bowed twice, clapped my hands twice to make sure the gods heard, and then bowed one more time. While there I also took time to write my wishes and hopes for 2014 and the future on a paper and placed it in an envelope with some coins and deposited in the box. The wishes will be included in the prayers of the priesthood at the temple. In addition to walking to and around all of the temples, shrines and gardens, I visited several other places of interest in Tokyo. And I had a few more navigational issues. Monday evening, I rounded out my first day at the Tokyo Metropolitan Government Building Observation Deck. The observation deck is on the 47th floor of the Tokyo Metropolitan Government Building and provides an impressive panoramic view of the city. On a clear day, which Monday was not by the time I made it there, Mt. Fuji is also visible. I am glad that I visited on Monday, since the weather was probably the best that day. While I couldn’t see Mt. Fuji I was able to see the majority of the places that I had visited while walking around the city. An added benefit to visiting was that I was able to pick up a guidebook that actually had some basic maps for key areas of Tokyo. My second day in Tokyo started with my trip to Meiji Jingu, which is located next to the Yoyogi Park, the site of the Tokyo Olympics and the Harajuku neighborhood. The Tokyo National Stadium, built for the 1964 Olympics, is still used today. After taking a few minutes to appreciate the impressive curves of the shell-like architecture and to take some pictures, I dove into the Harajuku neighborhood, seeking out one of the largest 100 Yen Store (basically a Dollar Store) in Tokyo. Harajuku was greatly influenced by the international culture of the Olympics and remains the hot spot for the young and innovative and is a center for fashion with just about every high-end international store present. 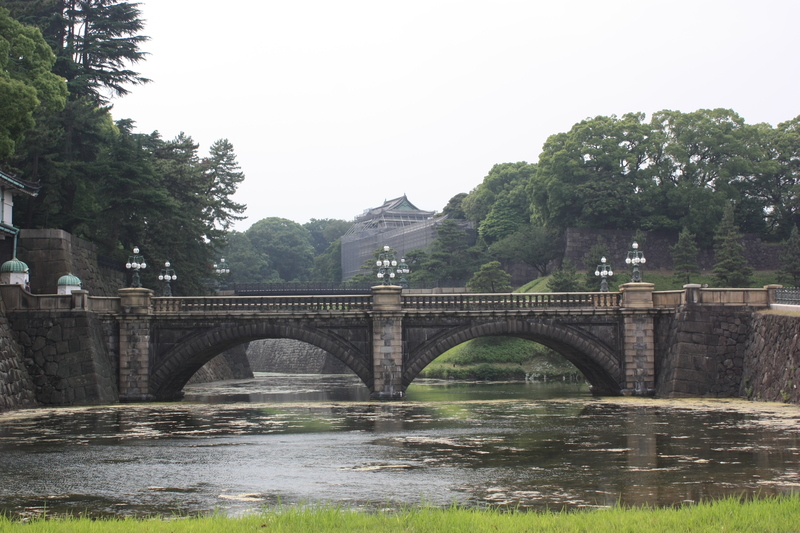 No visit to Tokyo would be complete without going to see the Imperial Palace. The large thick, deep grey colored, stone sloping walls surrounded by a moat and the white and brown palace buildings are a stark contrast to the shiny, sleek, modern glass buildings of Tokyo. I had tried to visit the Imperial Palace East Gardens on Monday, but they were closed. Originally I had planned to visit the gardens on Tuesday; however, when I got there I felt I had pretty much had my fill of gardens. So I went to see the famous and often photographed Nijubashi bridge, the main gate stone bridge. The stone bridge reflected in the green-ish moat water accompanied by the massive stone walls, green vegetation and white building is truly picturesque. My last morning in Tokyo was pretty much consumed by a walking tour of Yanaka. I’m pretty sure that Yanaka means “place of many, many temples”. The walking tour outlined in the guide book started at Nezu subway station. So I went to Nezu station, consulted the information map outside the station and started walking… in the opposite direction… again. Only figured it out once I made it to another subway station and after consulting my subway map confirmed that I had walked the wrong way. Backtracking, I made it back to Nezu station and started the tour. Finding the temples and shrines proved to be a little tricky, since for the most part they look like fancy houses with gates stuck in amongst the narrow regular buildings. The only way I found one of the temples is that the tree outside of it had an information marker telling me that it was one of the only remaining red oaks in an urban area and was located behind the Gyokurin-ji (temple). The walking tour took me through several back streets and by literally dozens of temples. While the walk wasn’t quite as picturesque and quaint as the guidebook made it out to be, it was a nice walk. I did stop in a few of the temples, noting the shrines and the gravesites and other interesting statues and plants. Growing tired of temples and all of them blurring together in my mind and my feet feeling the sting of walking so much, I sped along to go to the Yanaka Cemetery, the largest cemetery in Tokyo. Cemeteries in Japan are pretty interesting. Families have an altar site containing a primary stone altar with the family crest on it and maybe a few smaller stone structures. Ancestors are honored with their information written on a wooden stick which is added to the collection already there. Offerings are made by living family members and each little plot is well cared for. The cemeteries are very peaceful and several that I visited had gardenia plants, their sweet aroma mingling with the scent of lilies and incense that had been placed at some of the altars. My last stop was Akihabara, the famous electronics district. Home of every electronics company you can think of and a mecca for gamers. The buildings are everything you would imagine it to be – electric and overwhelming. SEGA, Panasonic, neon signs in Japanese, anime posters, all larger than life on the tall buildings that soar to the skies and assault the senses. My main destination was the Tokyo Anime Center, since my niece and a few of the young people that are in my life are interested in that. The center itself was actually quite disappointing, not offering much in the way of exhibits and offering a lot in the way of very high priced souvenirs. Walking around the area and taking in all the hustle and bustle was much more interesting. So what to do when you discover that your flight is almost 2 hours delayed? I ended up going on a bike adventure in an attempt to find some lunch and see the last remaining trolley car in Tokyo. The woman at the hotel gave me directions to a soba noodle shop and the key to her bike and sent me on my way. Half of the adventure was just getting on the bike and getting going. The seat was set so low that my legs were bent the entire time. Eventually I got the hang of it. Off I went on the sidewalk, trying to stay in the bike lane area and not to hit any of the people walking. Think I may have scared a couple of them with my wobbling. Finding the last remaining trolley car line in Tokyo, the two trolley cars ferrying people the short distance of the line, was my first success. On I went to find Joyful Minowa shopping street where the soba shop is located. A few interesting turns and there it was. After a couple of attempts at asking where the restaurant was, I finally understood that it was closed today. Sadly, I opted for take away tempura and some rice, went back to where the trolley line ends, and had my lunch. The victorious part of this adventure is that I actually made it back to the hotel successfully. I have no idea exactly how many miles (or meters) that I walked during my 3 days in Tokyo. Many of the subway stations involved walks of 200-300 meters to get between subway lines. By the end of my second day I wished I had a pedometer to track the miles. At the end of my visit to Tokyo, 3 reasonably annoying and a little painful blisters graced my feet, one for each day I was there. I love the impressive efficiency of subways. The way the wind gushes in a rush of air in front of an approaching train. The rumbling sound as the train arrives. The constant announcements and interesting signs, especially in foreign countries. The often long escalators descending deep underground or taking you up to the surface. 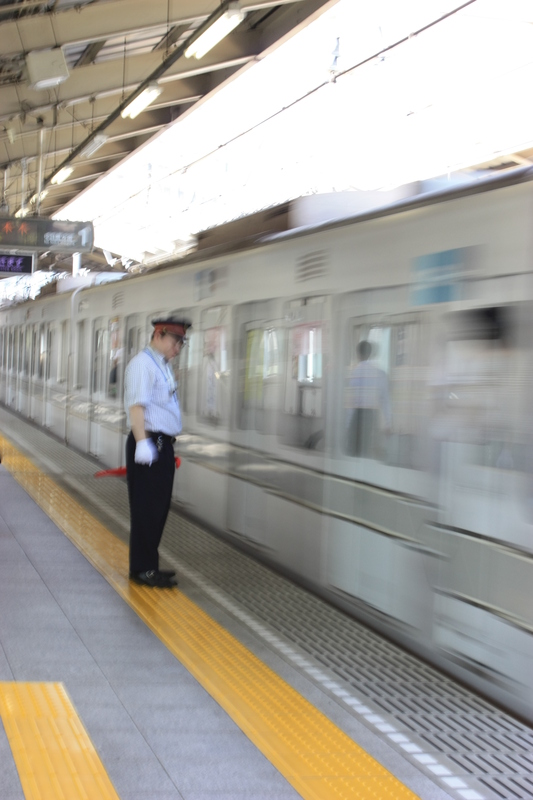 The Tokyo Subway system is a model of efficiency and punctuality. Made up of two lines, the Tokyo Metro Line (9 lines) and the Toei Line (4 lines), you can swiftly get from one side of the city to the other in typically less than 30-45 minutes. Trains are spaced about 5 minutes apart, sometimes less, or 10 minutes at the most. Unlike many of the commuters, I was never in a rush to get anywhere, but knew better to stay out of the way when figuring out where I was going. The Tokyo Subway Route Map became my constant companion. The Tokyo Subway app provided a helpful companion in figuring out which route to take and how long it the trip would be. Each of the 13 lines are color coded with an assigned letter (A, C, E, F, G, H, I M, N, S, T, Y and Z) and station numbers identifying each station. Thankfully all of the stations have the name in English as well as Japanese. I remember this being different when I visited as a child and we had to match the kanji characters on the map with the information in our guide book. Over the course of my 3 days in Tokyo I rode 11 of the 13 lines comprising the system (missed F and Y). The most cost effective way to use the subway as a tourist is to purchase a One-day Unlimited Pass ticket. For 710 yen (about $7) you can ride all of the Tokyo Metro Line lines as much as you want. Or for 1000 yen (about $10) you can ride all of the Tokyo Metro and Toei lines. I definitely got my money’s worth of my one day passes. Subway stations during rush hour are an interesting and fun experience. Commuters line up methodically at the designated door locations, the bigger stations having actual lanes marked out. When the train arrives, space is given to those exiting the trains. Then all of the people queued up squeeze on to the train. White gloved metro workers are present to make sure everything is orderly and to help push people into the cars if necessary. Watching the white gloved workers greet and send off each train was a wonderful display of synchronicity and respect. Upon arrival, each of the workers would salute the driver as the train passed by. When all of the people were loaded, there was a check up and down the line confirming the doors were clear. And as the train departed, each worker in turn would point in the direction the train was traveling. Many commuters come from well outside the city, with the typical commute taking around an hour or more. Often people would be sleeping. Watching them I wondered two things: how do they sleep standing up? And, how do they not miss their stops? Typically I am not a fan of major cities. I have spent almost no time in Bangkok in all of my trips to Thailand. New York City, Delhi and Beijing were overwhelming, dirty and polluted. Tokyo is an exception. Tokyo is very clean and has pretty much no perceivable pollution. Most districts have a ban on smoking on the sidewalks. Established smoking areas, typically partitioned off with panels, are located every 5 or 6 blocks. Litter on the street is almost non-existent. Bottles are recycled religiously, with a bin located by pretty much every vending machine. Even traffic is minimal for such a large metropolitan area, a testament to the efficiency of the subway system and the considered ease of using a bicycle to get around. On my hours of walking around the city, one thing that struck me was the conformity of it all. Most notably was the conformity of clothing throughout the city, Harajuku being a distinct exception. It seemed as most everyone was wearing dark blue or black pants or skirts, with a light pastel top ranging from white to tan to light blue to light pink. The occasional colorful dress or shirt was definitely eye-catching. Harajuku was a blast of color and individualism that I didn’t really experience elsewhere in the city. Even the buildings in most districts were relatively conforming in color. Some of the skyscrapers have unique architecture, although most of them all are that metallic blue-ish color of glass reflecting the sky. Smaller buildings and houses ranged in the tan-white-grey color palette. Tokyo is a very new old city. The history of the city goes back over a thousand years. Unfortunately most of the buildings were destroyed during the fire following the Great Kanto Earthquake in 1923. Buildings that managed to survive the earthquake were destroyed by air raid bombings toward the end of WWII. While temples and shrines were rebuilt according to the original plans, the actual buildings only go back about 70 years. Some not even that far. Every bit of available space is used efficiently. My hotel was a testament to this fact. My single room was about 3 feet wider and about 3 feet longer than a twin bed. In that space was a bed, table, stool, tv, waste bin and a small closet. The room wasn’t uncomfortable. Besides, you don’t go to some place to spend time in a hotel room. The bed was the typical firmness of any Asian bed. The pillow was made of a mesh bag filled with hollow pink plastic beads about a centimeter long and the diameter of a large straw covered with a pillow case. Strangely it wasn’t as uncomfortable as that sounds. My room was on the 8th floor, the ladies floor. At the end of the hallway you could go out onto the emergency balcony for a view of the Tokyo Skytree, another tall tower offering a panoramic view of the city, and the Tokyo skyline. At night the Skytree is lit up, each night with a different color. My first morning I woke, first to the sun rising at the terribly early hour of 4:30 (I had forgot to close my actual curtain), then to the gentle rolling sway of the building. In my bleary state it took me a minute or two to realize that it was a shockwave from an earthquake. Part of my purpose for spending time in Tokyo was to see it through adult eyes. Having visited Japan with my dad in 1982 and again in 1990, I hold many memories of places we visited and the experiences we had in our travels. Each time I heard the train announcement for the Ueno station (Ueno, Ueno des) I remembered the very first time Dad and I traveled into the city, groggy from our flight from Hawaii. Visiting some of the sites, I remembered that I had been there before. And all of this brought a smile to my face and my heart.